Firefighters from multiple area communities attack a fire gutting two buildings on Main Street in downtown Van Buren, April 7, 2019. 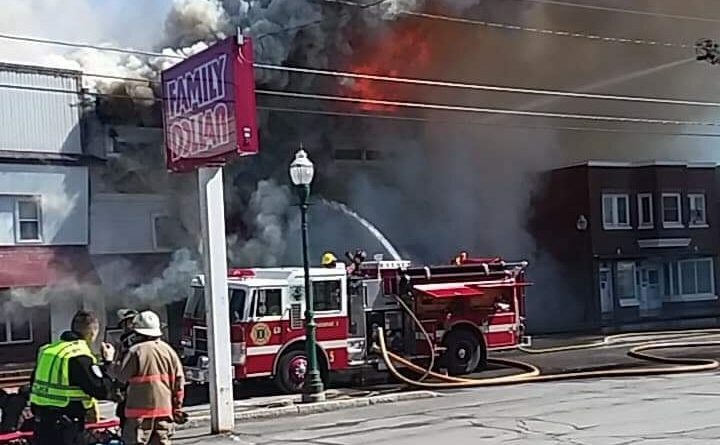 Officials are still investigating the cause of the fire that burned down two buildings in the middle of downtown Van Buren on April 7. As of Sunday Van Buren fire Chief Brian Caron said he hadn’t heard any updates from the fire marshal about the cause of the fire and that the investigation continued. The fire at 72 and 74 Main St., which was reported at about 9:30 a.m., caused officials to shut off power and close off the downtown on April 7 as about 60 firefighters from Van Buren, Grand Isle, Limestone and from across the St. John River in St. Leonard, New Brunswick, kept pouring water onto the structures to prevent the fire spreading to neighboring buildings. Caron said the fire appears to have originated from the basement of the former Ezzy insurance building at 72 Main St. He said he couldn’t tell exactly what caused it but that there were no signs of anything suspicious that he could tell from the rubble. “It’s just normal protocol when we get a fire this size, we can investigate the fire to an extent, but we don’t have the training that the fire marshal has,” Caron said. One of the two residents who rented apartments in the 72 Main St. building owned by Spencer Ouellette was home when the fire started and called 911. She was able to get out unharmed. The other resident was not home. Firefighters managed to save a cat from the second floor apartment, according to Caron. Residents of neighboring buildings were evacuated to ensure their safety as firefighters worked to contain the fire. The fire also destroyed the building at 74 Main St., where the Hebert Rexall Pharmacy used to be. The pharmacy moved to 31 Main St. in June 2018 and the old building, which was still owned by the Heberts, then housed a martial arts studio. According to pharmacist John Hebert, his grandfather bought the building and an existing pharmacy at 74 Main St. in 1942. The grandfather reopened Findlen Drug after a brief closure. The name changed to Hebert Rexall in 1976. While the building at 74 Main St. was insured, John Hebert said there were still a lot of historical items in the old building, including the soda fountain and its fixtures, that were destroyed. His family also used the second story for storage. On Tuesday, firefighters and other volunteers were able to access the basement of the burned out building and retrieve pharmacy files dating back to 1903. John Hebert was not available for comment late in the week. Earlier in the week, however, he said, “We are very sad to have lost our historic pharmacy, but are blessed and thankful to be a part of such a supportive community. The outpouring of support has been tremendous. This story was originally published in the Fiddlehead Focus.